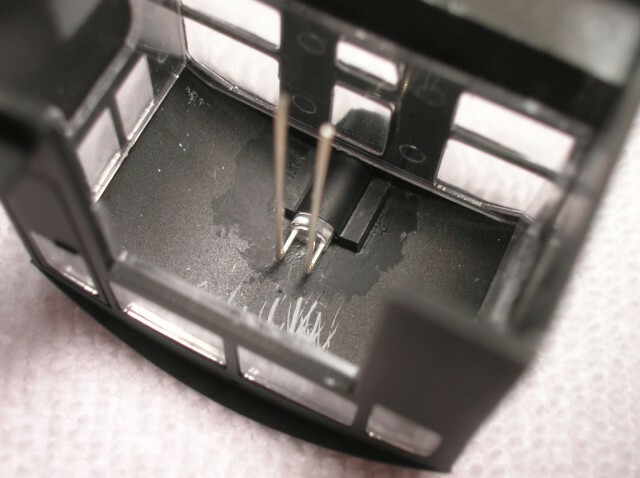 Step 1 - Remove any obstructions from the interior roof of the cab (near the rear headlight lens) with a #17 X-acto blade. Care should be taken to remove as little additional material as necessary so that the light tube is flush with the roof of the cab and aligns concentrically with the lens of the rear headlight. 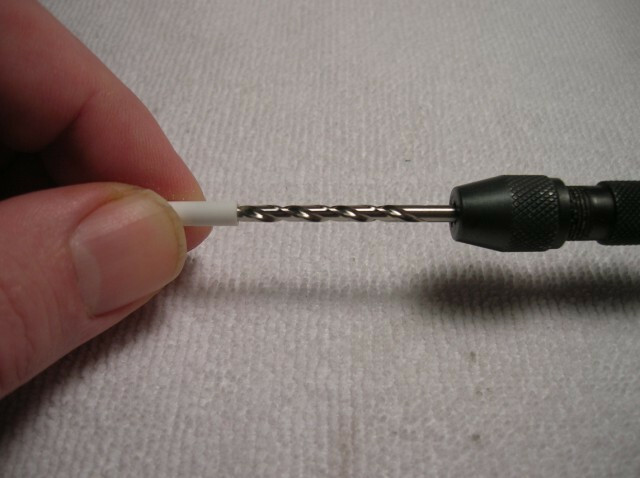 Step 2 - Using a #32 drill bit inside a pin vise, hand drill a 1/4" deep hole into one end of a 1/2" long section of 5/32" OD styrene tubing. 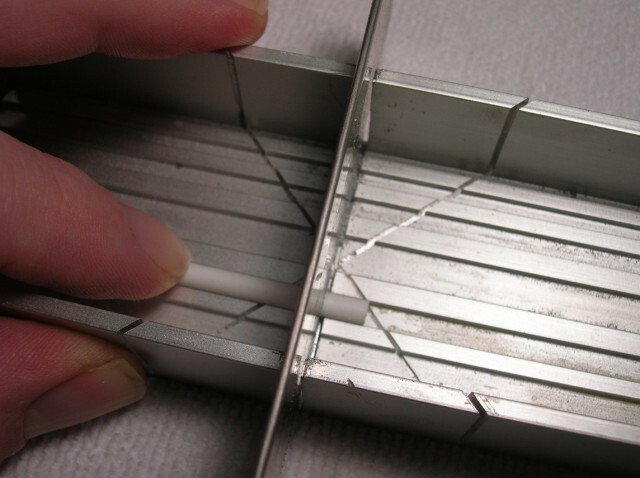 Square the end with a small flat file (if needed) so that the face of the styrene tubing is perpendicular to its side. Step 3 - Use a razor saw and miter box to trim the drilled end of the styrene tubing to ~1/4" in length. Square the cut end so that it is also perpendicular to its side. HELPFUL TIP: At this point it's a good idea to test fit your 3mm LED inside your light tube. 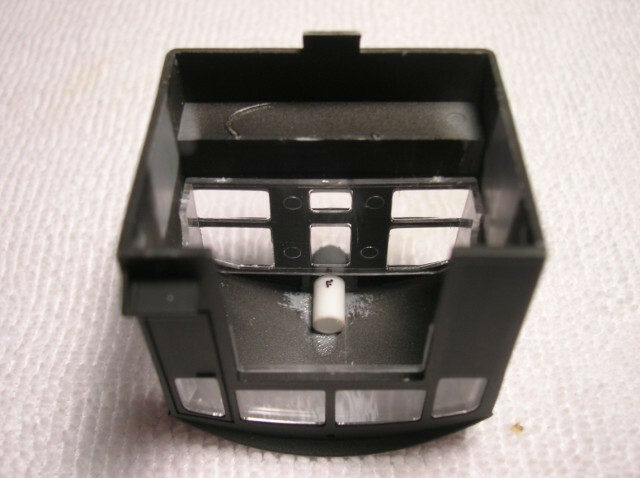 The LED should "press fit" inside of the light tube but still be removable with little to moderate effort. 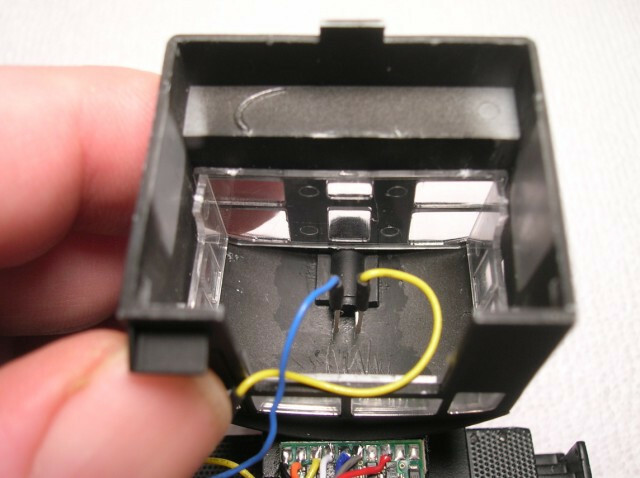 You want the LED to be snug inside the light tube so that it stays in place but also removable, if and when the time comes to replace the LED. If the fit is too snug, use the pin vise and #32 drill bit to ream out the hole a little more. If the fit is too loose, you can use a tiny amount of Elmer's glue to secure the LED inside the light tube later on once you have everything wired up. To remove the LED, just wet the glue to soften the glue. Step 4 - Center the light tube in the top of the cab so that its center is flush with and concentric to the rear headlight lens. 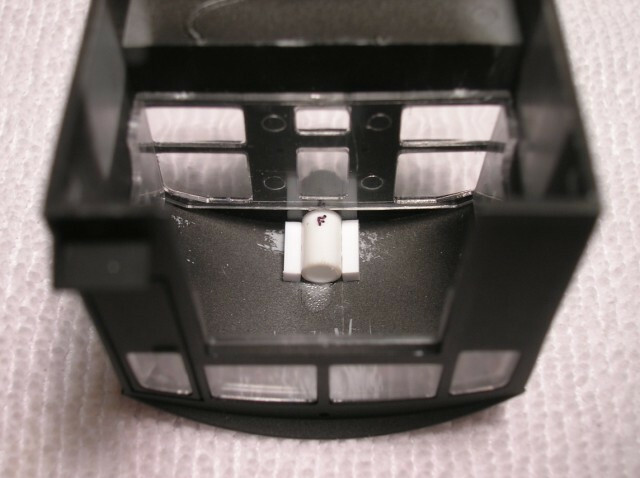 Use a small amount of liquid adhesive to secure the light tube to the top of the cab; being careful not to get any on the lens. Let adhesive dry for ~1 hour. Step 5 - Cut two (2) 1/4" long pieces of 6 x 6 dimensional styrene. Lay one piece on each side of the light tube and secure them to the light tube and cab roof with a small amount of liquid cement. (Again, being careful not to get any on the lens.) Let adhesive dry for ~1 hour or overnight. Step 6 - Once the bracing is dry, paint the exterior of the light tube and bracing with a styrene-compatible flat black to eliminate light leakage. Be careful not to get any paint inside the light tube. Let paint dry over night. Step 7 - Press-fit a 3mm (T1) Golden-white or Sunny-white LED into the light tube and connect it electrically according to common electronic practices. I´ve added LED lights to several of my engines (HO). Instead of using the existing lens, I pounded it out so that the LED (3mm) actually replaced the little lens. After hooking it up to a current limiting resistor and wiring it up it works quite well with a lot of light. I´ve even replaced several lenses in my steam engines with 3 mm LEDs and they are considerably brighter than the original incandescent bulbs with the clear lenses. Sometimes I have to enlarge the holes with a small rat-tail file or drill bit. I usually use a drill bit chucked into my Exacto #2 handle to use as a pin vise. If the hole isn´t quite large enough, then I break out the file to finish the hole to the right size for the LED. Now I have several lenses in case I ever want to change it back to an incandescent bulb, which I´ll probably never do. So if anyone needs some spare lenses, contact me and I´ll send ´em to you.